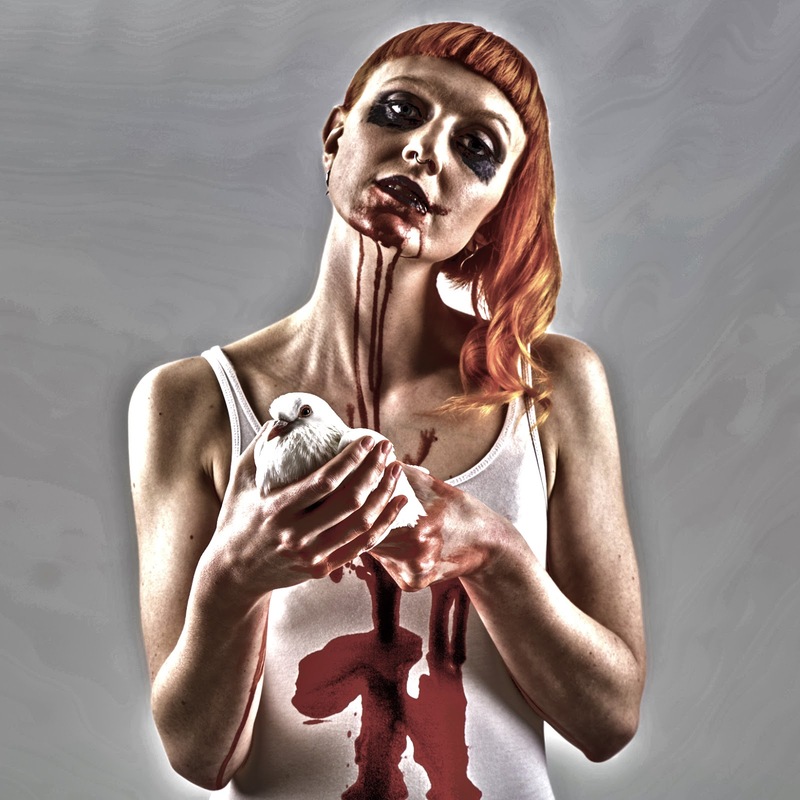 I regularly mention Brighton orchestral dark cabaret weirdos Birdeatsbaby on other social media platforms so it's surprising that apart from a brief mention in my round-up of 2014, I haven't written about them in detail here. They are a prime example of a band who use social media to its full potential and they give regular webcasts to preview new songs. An offhand online comment I made during one of these sessions has somehow resulted in frontwoman Mishkin Fitzgerald being booked by my friend Lobelia Lawson to play at one of her intimate Sunday night events. I've not seen the band or any of its members live before and despite feeling that I know her well, I've never met Mishkin face to face until the night before the gig when I find her at my front door, laden with bottles of gin. This sets the tone for the rest of the weekend. I've written before about making a distinction between an artist's work and the artist as a person. In some cases you even need to distance yourself from the individual in order to enjoy the music; this is the case for me with Morrissey in particular. It's much easier to draw that dividing line when you get to know an artist personally. Mishkin's easy-going day-to-day persona is very different from the gloomy character portrayed in her lyrics, although I should add that I have no reason to distance myself from either as they each appeal to a different side of my own nature. She can be self-effacing and alternately refers to herself as an "orange-haired vegan piano warrior" and a "dweeb". I get to know the latter during an afternoon's drinking and forget that this dweeb will later transform into the piano warrior with a quick change of outfit. Mishkin is known on social media for her vegan lifestyle and animal rights campaigning but it's interesting how subtle she is about this. She is not at all preachy about her beliefs and there is little direct reference to them in her lyrics, although there are general themes of compassion and suffering. That aforementioned bequiffed individual could learn a lot here; if he were to be a little less bombastic then perhaps more people would be prepared to listen to his opinions. I often pick up a setlist as a souvenir of a gig but rarely think about how the sets are planned; for example, are the same songs played every night of the tour? With an hour to go before show time, Mishkin pulls out a list of around 30 possible songs and, with a bit of help/interference from me, selects 11 to be played tonight. The songs are then shuffled into a satisfactory sequence, reminding me of the effort that goes into compiling a mix CD. First of all you need to select a suitable opening and closing number, then finding a stylistic flow between the intervening songs is the hard part. But making a mix CD is nothing compared with this. What's impressive is that any of those 30 songs could have been played spontaneously even though the day has been spent drinking rather than rehearsing. The mark of good songwriting is that the work can be played in a number of different styles and remain meaningful; the mark of a good performer is that they can play any songs (their own or those of another writer) and make them fit the mood. Although there are differences in style between Mishkin's solo work and the more expansive sound of Birdeatsbaby on record, tonight I genuinely can't remember which songs come from which project as what we get is a consistent flow of beauty from start to finish. When I get home I check the setlist against the CDs to confirm the origins of each song. The set contains five songs from the new EP "Seraphim", two from the previous solo release "Present Company" and three Birdeatsbaby numbers, including one from an album to be released later this year. There is also a song by a band called The Devil Makes Three, labelled simply as "DM3" on the setlist so I'm not sure of its title. Although the fact is no doubt mentioned during the show, I fail to notice that it's a cover as it fits seamlessly into the set. I'm always intrigued when an artist has favourites or influences I've never heard of so I make a mental note to investigate The Devil Makes Three further. I'm far from being a musician so find it fascinating to watch performers' movements closely and marvel at the technical skill, particularly when I have no real understanding of how the sounds are produced. When she's not performing, Mishkin works as a piano teacher, with the parents of Brighton queuing up to book lessons for their offspring and it's clear why she's in such hot demand. As someone who struggles to co-ordinate different parts of my body simultaneously, it's frightening to see how flexible her hands are. Dear lord, surely the thumb and index finger were never designed to be stretched that far apart?! The fact that she can do all this and sing at the same time is astounding enough but this is more than just singing, she has a truly amazing voice. The short a cappella piece "Deep In The Water" leaves the crowd with jaws on the floor but before we have time to take in what has just happened, she's back at the piano for the EP's title track, subtitled "Leaving Me Out". This is perhaps the most heart-wrenching song I've heard this year and it's possible I might have shed a tear but we put that down to the gin. The only way to end the set is with "Rosary", with some of Birdeatsbaby's most disturbing lyrics promising that "you'll be so sorry when they find my body" - another example of the distinction between her on- and offstage characters. Knowing of her happy home life, I can't imagine the "real" Mishkin having thoughts of that kind although she mentioned earlier that someone was worried about her state of mind after seeing the gruesome cover of the new EP. After the show, several people thank me for allowing them to see such an amazing performance but I don't feel I should take the credit here. All I did was suggest that I would like to see one of my favourite performers and then hand it over to Lobelia and tour promoter Simon to do all the hard work. However this does show that many artists welcome suggestions from their audience and any input, however small, can lead to great things happening. Even if, like me, you mostly feel like a bystander in your local music scene, you should still do whatever you can to get involved. A tour with the full Birdeatsbaby line-up is on the cards for the end of the year and I look forward to another gin-fuelled weekend although we agree that bassist Garry Mitchell will be consigned to sleeping in the shed. The EP "Seraphim" is available in a five-track format now, with an expanded ten-track version coming at some point in the future. I already have the subscribers' download copy with all ten tracks so I'm not actually sure which of tonight's songs are on the current version. 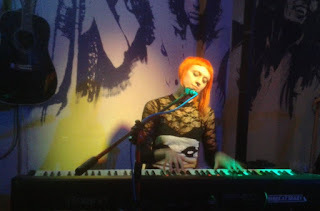 If you want all the songs now your best bet is to subscribe to Birdeatsbaby's Patreon programme. This will give you early access to all new material, at whatever price you can afford to pay, and also regular opportunities to interact with the band.